Our classic buttercream fragrance oil is just what it ought to be: a rich blend of fresh churned butter, sugar, and all natural vanilla bean. 100% Soy Wax Melts all hand poured and heavily scented with premium scents for maximum enjoyment. 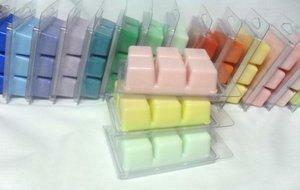 Each 6 pack soy wax melt is 3oz and gives hours of great fragrance.